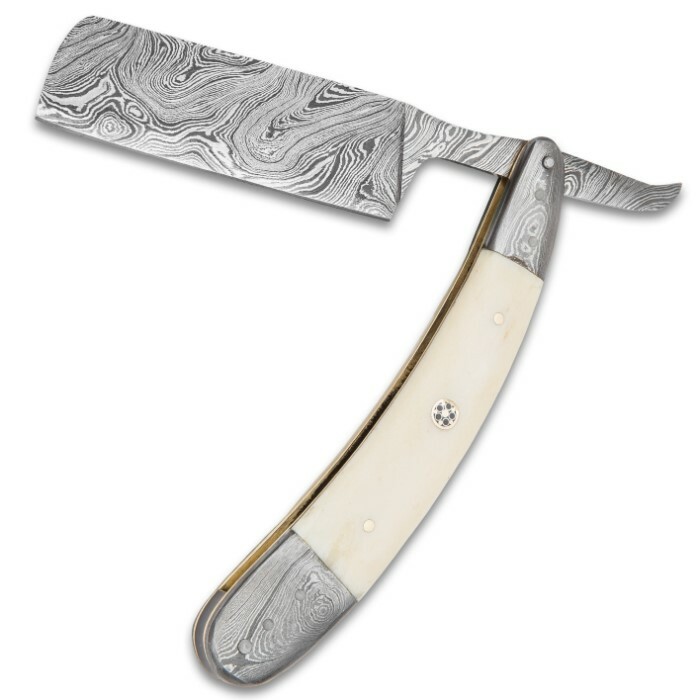 Timber Wolf Torrent Straight Razor - Hand Forged Damascus Steel - Genuine Bone - Vintage Barber Barbershop Shave Shaving Folding Folder - 6" Closed | BUDK.com - Knives & Swords At The Lowest Prices! 5 1/2" folding straight razor blade - hand forged from Damascus steel, carefully honed to yield edge that's literally "razor sharp"
The "Demon Barber" of "Damascus"
You'll never see anything this breathtaking at your local barbershop! 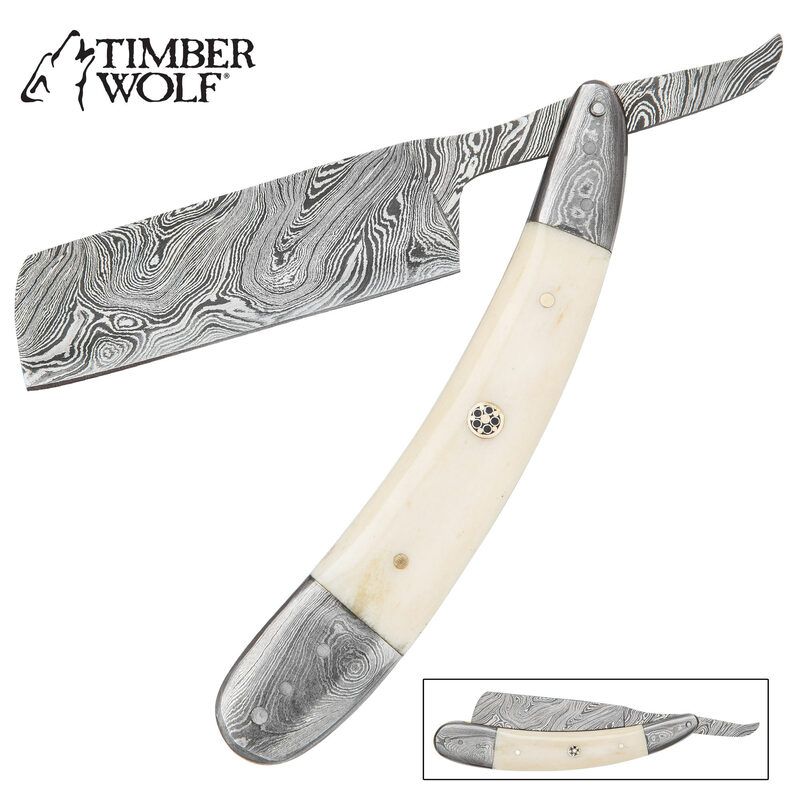 Truly one-of-a-kind, Timber Wolf's "Torrent" combines the vintage appeal of the straight razor with the striking allure of Damascus steel, then sprinkles in a bit of rustic flavor from genuine bone for good measure. The result is a knife like no other - a hand-forged masterwork that's a must-have for any serious collector, straight razor enthusiast or anyone who simply appreciates fine craftsmanship and rare beauty. And the Torrent's spectacular beauty is indeed "rare..."
True to its name, the Torrent's Damascus blade is a raging steel river through which hundreds of distinct, contrasting lines flow. The lines twist, writhe, ripple and whirl as if swept up in some unseen current, forming captivating, near-hypnotic patterns across the surface of the blade. But this striking figure is more than just skin-deep, as each line represents a distinct layer of steel that forms the underlying fabric - nay, the very heart and soul - of the Torrent blade. To put it plainly, the blade's spectacular patterning is the natural result of the ingenious, time-honored hand-forging technique utilized in its construction. While the straight razor itself may seem old-school, Damascus steel's history is far older - with shadowy roots planted at least a millennium ago. Timber Wolf's seasoned bladesmiths still hand forge every Torrent blade using a technique very similar to that employed by their ancient forebears. A smith fires a stack of steel strips - each a different alloy - in a white-hot forge until the metal glows cherry red. He then removes the stack and hammers it until it’s around half as thick as the original. Then he folds the metal onto itself lengthwise and hammers each half together. The process is meticulously repeated until the desired layering effect is achieved, at which point a final quenching strengthens the resulting blade blank and an acid etching highlights vivid contrasts in the layers. And the slow, laborious process itself it just the beginning! To achieve sufficiently dramatic contrasts, Timber Wolf’s master smiths must expertly select an appropriate combination of steel alloys of varying color, luminescence and other visual qualities. For the sake of strength, resilience and countless additional blade factors, the smiths must also must consider each alloy’s distinct melting point, proper stacking order, forge temperature and myriad other variables. Simply put, an unbelievable quantity of blood, sweat and tears goes into every Torrent blade, but lay eyes on it just once - or, better still, experience it in action - and you’ll know it was well worth the trouble. And like a steel snowflake or fingerprint, the patterning on no two Torrent blades is exactly alike. Let yourself go - get swept away in this overwhelming Torrent of quality, distinctiveness and raw, captivating beauty. 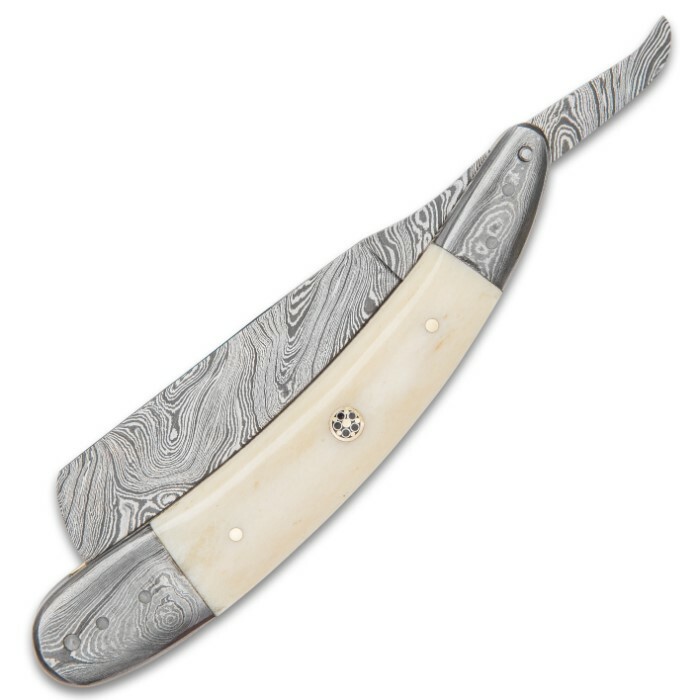 Order Timber Wolf's Torrent Straight Razor today and add that unique finishing piece your collection's been missing!